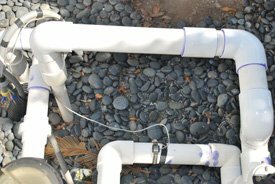 A San Diego homeowner called and asked if we would repair the pool equipment plumbing on their Tierrasanta, 92124 swimming pool. 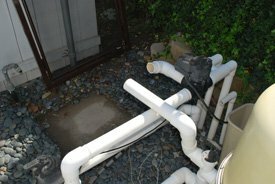 They had removed an attached inground spa along with the pool heater. 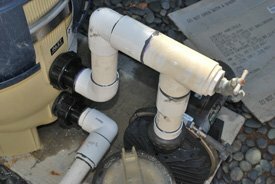 To reattach the pool plumbing we first removed the Jandy 3-way valves and compool actuators which were no longer needed. While removing the spa plumbing we noticed a new Pentair Clean and Clear cartridge filter had been installed incorrectly. To correct the filter installation we removed the push pull backwash valve which was left over from the old D.E. filter. 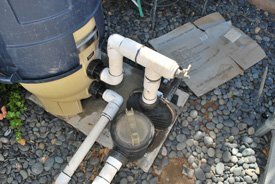 During the plumbing repair we added a hi temp unions to the suction side and return side of the Sta-Rite Max-E-Glas pool circulation pump. 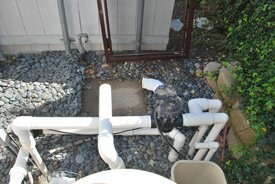 Once the pool was circulating again we checked the water chemistry and gave the homeowner advice for future use. 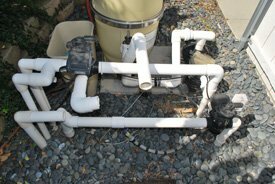 We called ProTouch because after we sold our pool heater, we were unable to run the swimming pool and we were concerned that we would start having algae grow in the pool since it has been so warm lately. They did a great job with the repair and were even cool enough to check my water chemistry and advise me on what was needed going into summer.